Like C4ND1M4N, I'm having trouble linking XCP addresses on the website. I believe you may have a bug in this process somewhere. This same problem has also happened to my two sons when I tried to do the process "from scratch." My wallet has a blockchain card in it, but it is not displayed in the game. Any ideas what we might've done to cause this error? I can send our wallet addresses if that would help. Hello, and yes, send me your wallet adress with a private message. After a first look, XCP entry looks like to be empty on database. Thanks for PM. 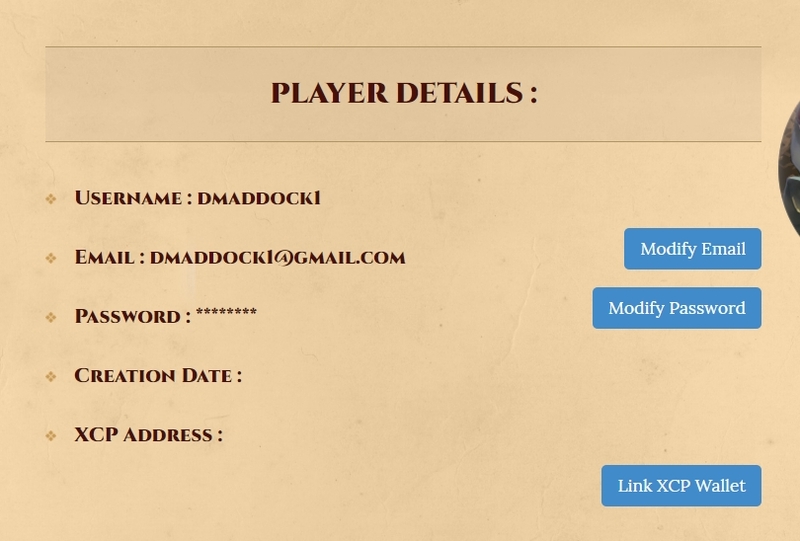 The accounts have been created from the website or from the game ? Ah, good question. I believe they were all created first in the game and only logged into the website when attempting to link the wallets. That would mean I used 1.0.4 on Android installed via the apk and the kids used 1.0.4 on iOS installed from the Canadian app store. EDIT : You can normally login again. I used your account and try to link the xcp address that you gave me and it worked for me (account dmaddock1) with no errors. So I don't know exactly why you got this error (that is triggered if the xcp address exists already in database, which was not the case). Maybe a space character or something, I'm not sure. If you need I update the xcp of you sons, I'll be glad to see the demand with this account names in reply on this topic and then I will proceed. Awesome! That definitely fixed my account. I can see my blockchain card in the game now. I gave it another shot with my son's account and recorded a video for you. I manually typed the address to avoid possible cut-n-paste issues. Thanks also for the video, it adds more details on this matter. The XCP is set to this two accounts also, I made a video also that show everything working fine. I'll be aware of any problems of this kind in the future to find out what's going wrong. When the account is created from the game, the creation date is not stored in DB, so yes, currently it's normal, but will be changed soon.